...are you lucky enough to have a room solely for the purpose of crafting or do you have to "share" a main room and hide your things away? Since becoming single again I now have my own, albeit small, craft room; we did use the largest bedroom - him for his model making, both static and RC and me tucked in a corner with my papercrafts. Sometimes our hobbies even overlapped but I digress. My little room is more of a hobby/chillout space. I keep all my DVD's in there too. It's also supposed to double up as a spare room so I have a futon I can pull out when needed. It has to be said that I really am not the most organised of people, I wish I was, I really do. I try to keep everything as ordered as I can and in the great scheme of things, I haven't much in the way of craft supplies. I think part of the problem may be that although I have some good storage, it isn't necessarily the right type! So, what does a craft room need? My number one is a bank of Gnedby DVD racks flanked either side by 2 narrow Billy bookcases from Ikea. I did have them in my lounge for quite a while until I decided on a less cluttered look; at one time we had around 500 DVD's between us! 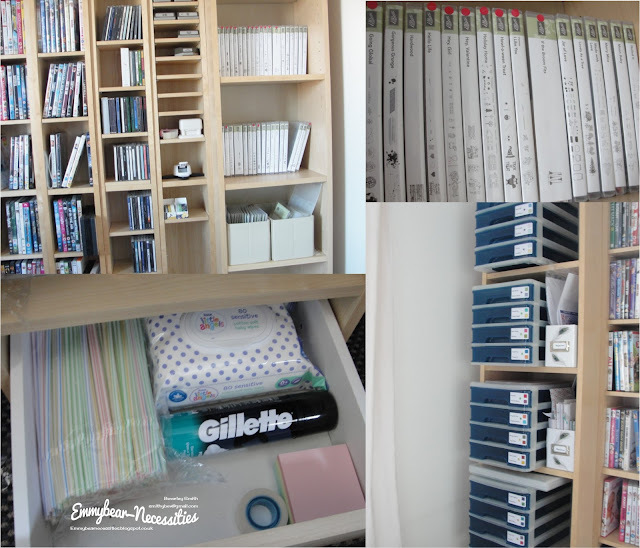 Now I keep all of my A4 cardstock in storage drawers on one bookcase but that may change in the future. The other bookcase has all of my stamp sets, arranged in alphabetical order; my stock of stamps, dies and punches has increased considerably since these photos were taken.. I put a red sticker on any item that has retired so that I can distingush between retired stock and current. One of the DVD racks houses my punches, too. Next is good lighting; I'm working on that still. I have a temporary set up until I can get the lighting that I really like but it will involve daylight bulbs. 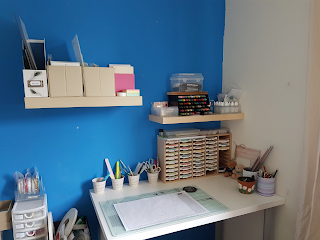 Now some would say that you need a big table - this is where I confess that I am more likely to make my cards on a lap tray downstairs. Oh I know the purists would be horrified, it isn't as if I haven't even got a craft table although it is smaller than I really wanted. The difference in Ikea delivery prices meant it made sense to go with the smaller desk and add some drawer units! It's funny as I'd started typing this up when Caroline Helwigh Wright - CraftyCarolineCreates - showed her craftroom on You Tube. And because of that, I realised what I was missing. Yep, I have shelves and small drawers but no cupboard and no proper drawer set. Ikea, I'm here; please can you send me a couple of pieces from the Alex range? You never know, with those in place I might even venture upstairs and work in there.